Artwork, structural glass, stairs and specialist structures are a source of difficult and thought provoking engineering design. It’s inspiring to work on strongly visual elements, not just for the pleasure that they may give to the client but also for the engineering challenge that they present. This is most evident in developing the details, particularly as the structural skeleton is often open to view. Engineering judgement and experience is needed, to consider the contribution that each detail may make to the structural behaviour, whilst maintaining the aesthetic appearance of that detail. The structural analysis often involves complex computer modelling. HMA work on staircases, glass design, mezzanine structures, balconies, balustrades, canopies and other miscellaneous small structures. 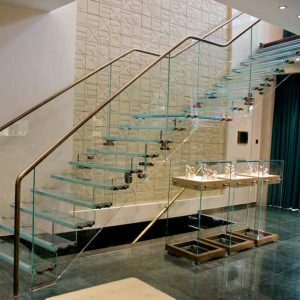 A stunning ‘floating’ all-glass stair for the Rolex shop in Leeds. Set against a flat wall, glass treads integrate into laminated toughened glass with special inserts fixed through the balustrade. At half landing level two structural glass fins cantilever from the wall to provide intermediate support for the balusters which carry the stair from base to top landing. Careful analysis was undertaken to ensure that all component parts combined structurally to carry the onerous commercial live loads and handrail loads. Built into an existing basement this stair presented a unique challenge. With careful attention to detailing and analysis, the upper treads part cantilever from a hidden steel stringer which acts as a ‘traditional’ cantilever stair with a continuation of the interlinked uprights between treads. 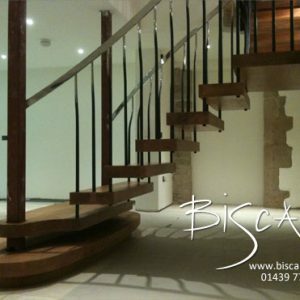 Helical stair with stainless steel stringers on which thin polished hardwood treads overhang. 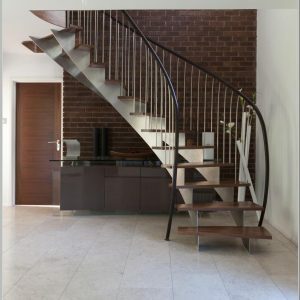 The stair has an elegant simplicity that demanded minimum visible fixings for the treads onto the stringers, whilst maintaining lateral rigidity. 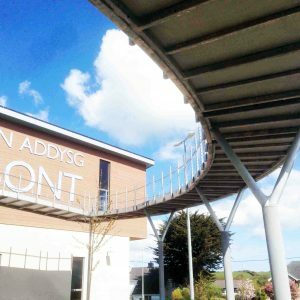 An access/escape ramp more than 60m long which curves from the first floor of a special needs school, Ysgol Y Bont School in Anglesey. 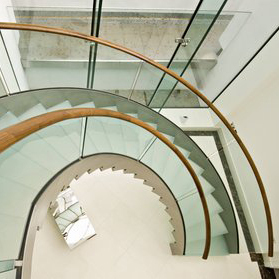 A stunning helical stair with stainless steel stringers and glass treads. An engineering challenge was presented in which the glass treads contributed to the structure of the stair – packed tightly between the stringers without unsightly fixings. 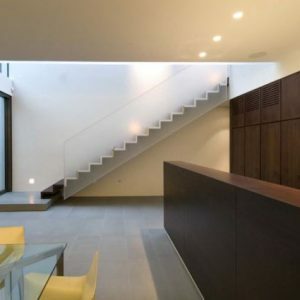 Constructed in the basement of a private residence, in London, the stair treads comprise folded steel plates. Nb. Any Projects undertaken at previous employers are outlined in the Credits section.